Everything I have ever baked has been full of eggs, butter, milk etc. I have wanted to try out vegan recipes as well as gluten free/ wheat free for a long time so I got myself some recipes and sourced ingredients for them. I have always loved banana bread so when I saw this I knew it would have to be one of the first things I tried out. I have to say, for somebody who has always been a little wary of gluten free baking, it was pretty darn good! Lightly grease the loaf tin with some coconut oil. In a bowl sift together the flour, baking powder, baking soda, xanthan gum, salt and cinnamon. Add the coconut oil, agave nectar, rice milk and vanilla to your dry ingredients and mix until smooth. Using a spatula fold in your mashed bananas until they are evenly distributed in the mixture. Fill the loaf tin halfway with your mixture. Bake in the centre of the oven for 35 minutes, rotating it 180 degrees after 20 minutes. When the banana bread it ready it will bounce back when pressed and a cake tester/ toothpick will come out clean when inserted. Let the banana bread cool for about 20 minutes. After the 20 minutes, run a knife along the edges to loosen. Cover the loaf tin with a cutting board and turn out onto the board. 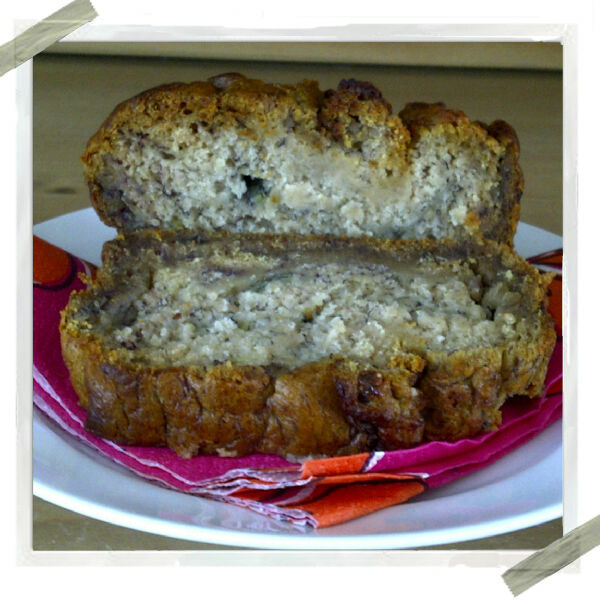 Get another cutting board and carefully turn the banana bread onto it so that it is right side up once again. Can be eaten warm or cooled and stored for up to 3 days at room temperature, in cling film.